The first Cashville Skyline post was carefully written while freezing beneath a blanket on the afternoon of New Year's Eve. It was hard to imagine where this blog would be in month, let alone a quarter. And here we are together, friends, experiencing my very first quarterly net worth overshare! The choice to share (or not to share) these kinds of details in such a public forum, like a blog, is a deeply personal decision. 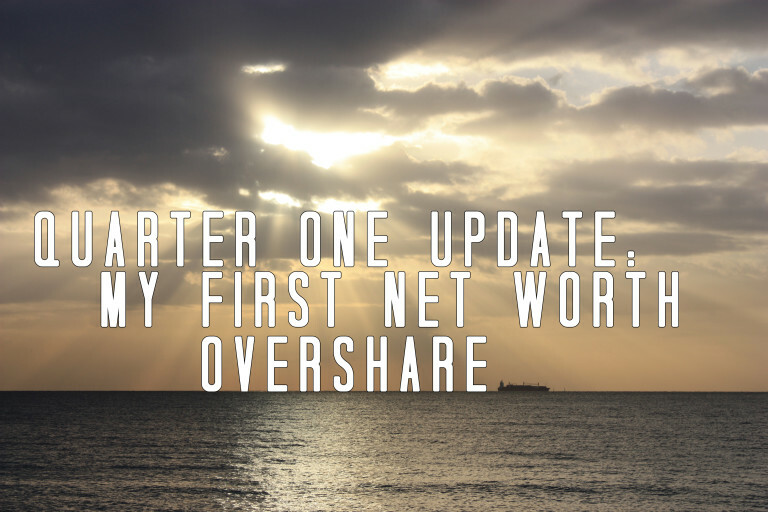 And I felt apprehensive at first, although being included in Rockstar Finance's Net Worths of Personal Finance Bloggers list has certainly helped me overcome my shyness quickly! What does my net worth mean exactly? Likely very little to anyone except me. It's a constantly changing number, much like my age or weight, and some may argue it offers no real measurement of anything. Sharing my net worth publicly is merely an exercise in setting a goal and holding myself accountable. – I've dropped my cash significantly. Remember my post about decreasing my emergency fund? Well, I lowered that sucker even further. – I made the maximum Roth IRA contribution ($5,500) within the first week of January. My index funds (VTSAX and VTIAX) earned $215.12 in dividends this quarter. Score! – I've continued buying index funds and ETFs in my taxable account (holdings include VFIAX and VYM). VFIAX earned $46.63 in dividends this quarter. – One of my second quarter goals is to start adding dividend producing growth stocks to my portfolio. I plan to continue purchasing securities through Vanguard. Thanks to Income Surfer and Our Cash House for the tips on discount stock brokers! – I definitely don't dig owing over $140K on my mortgage, but with a 3.25% fixed interest loan, I feel very little motivation to pay it down sooner. And it will be paid off in less than 13 years! Readers: How has your net worth changed over the first quarter of 2014? What are your net worth goals for this upcoming quarter? Diggin' what you’ve read? Stay on top of my latest posts by following Cashville Skyline on Facebook, twitter, Google+, and Pinterest! Nice job on the dividends. I can’t wait to start earning that passive income! $6K is great, Alicia! It sounds like you’re making amazing progress. I’m excited to start earning more passive income, as well! That’s awesome, John! I’m impressed that you’ve accomplished all that in Q1. Thank you so much for sharing these details! I think transparency is so powerful. It keeps you honest and motivated. Also, I loved reading your different goals for the quarter, such as investing. It’s great to see a different way of doing things (investing versus saving an emergency fund). Thanks! Nice work this quarter! The first quarter usually lags for me because I have a bunch of bills come due (real estate taxes on my home and investment properties is probably the largest). I’m expect some larger gains this quarter. I am a huge fan of making your cash work harder for you so I definitely applaud your strategy! And I always look at the mortgage payment in terms of cost benefit analysis. If you can earn more than 3.25% investing, then you are better off having your money there then paying down cheap debt. Agreed, Shannon. It may be right for some people who want to be completely debt free, but I’m okay with paying it off over the next 13 years. I always love seeing the debt number go down and hence the net worth line go up. I only check my twice per year so will do an evaluation in June. My hunch based on the direction of the markets and our continuing habit of saving/investing is that it will be higher than in December. Great work Addison! I promise our networth didn’t rise nearly so much this quarter, but that’s ok. In fact at the moment I’m craving sleep over money…..our son was born last week. Thanks, Bryan! Congratulations on the birth of your son. Yeah, I’m not sure I trust Zillow’s “guestimates.” Haha. It’s so encouraging to see how someone like you is prioritizing their finances and making great financial decisions. Kudos on the investments AND maxing out your Roth! One of the things were prioritizing this year is actually getting more of our disposable income into securities. For the time being, most of our investing is done through the index and etf’s. It’s time that we get more into educated stock picks for 2014! (And paying off your mortgage in 13-14 years is still a huge deal!) High fives!! Thanks for sharing! I post our numbers to keep myself accountable. We’re reducing our cash emergency fund this month too – it’s a little scary, but hopefully it’ll make more money invested. Thanks for commenting, Laura! I just really didn’t need over $10K is cash sitting around. Felt like a wasted opportunity. I track my net worth monthly and I’ve seen some healthy gains for the year. As long as I get steady growth, that makes me happy. There are some months when my net worth is down, but that is usually due to the market down for the month by a decent amount as opposed to taking on more debt. That’s awesome, Jon! Steady growth is definitely an accomplishment. Our net worth went up about 17K. I like this idea of doing a quarterly net worth recap. Good to build up a history on your blog. Thanks for the link to Rockstar Net Worth blog lists too! Wow, I’m impressed! +$17K is fantastic! Congrats Addison, those are some seriously awesome numbers! And major score on the dividends. Like you, that is my next goal. I just want to own a bunch of assets that produce money like clockwork. $0 is amazing for a student! I can’t believe you’ve managed to stay in the black. Kudos! Cool, congrats man! You just moved up a cple slots on my Net Worth Tracker too 🙂 Glad you like it! Thanks for sharing…I know most people don’t like to share the details of their personal finances as they think it’s very private, but sometimes it’s good to keep you accountable and motivated. I’ve been thinking about sharing…I dunno! Definitely a personal decision, but I enjoy sharing! I’m sure you’ll figure out what’s best for you. Well done overcoming your fear and fixing your shyness. Great things come from stepping out of comfort zones. How to retire a millionaire if your not willing to take risks. Calculated risks that is. What does Roth IRA mean? Thanks, Jeff! A Roth IRA is a type of IRA that allows your money to grow tax-free. It’s funded with after tax dollars and the funds aren’t taxed when you withdraw in retirement. Wow, I’m jealous! I wish I’d already maxed out my IRA for the year, but getting ahead quickly with my finances is not something that’s likely to happen while living in NYC. Sigh. It was easy to do once I realized I needed to drop my cash down. I had previously been holding on to over $10,000 in a high interest savings account. Ouch. You’re almost to six figures of net worth! So close! Great job nailing the bottom of the market on interest rate on your place! I agree that it makes little sense to pay it off early when you got the rate so low. Factor out the tax savings, and the rate is below the inflation rate. I was definitely nervous at first, but it feel strangely liberating now! Yeah, pretty stoked about the interest rate on the mortgage. Thanks for the encouragement.